3.6: Nothing changes, except using Bottled Faith instead of the Silver flask of warding for bosses. Changed the tree a bit. Dropped some of the life from scion life wheel to get ones near marauder and grabbed winter spirit. Will add more stuff if 3.6 reveals some fitting gear choices. Hi, this my sixth build guide. Fast map clearer. (Not the fastest). Playstyle might be umcomfy for bosses. Can't deal chaos damage, so that excludes all the % gained as chaos mods. I just wanted to make something with Voidforge and consecrated path seemed like a good fit. Since we deal triple elemental damage, we need tri pen. Inquisitor is an obvious choice. Also consecrated path thematically makes sense with templar. Instruments of Virtue feels good early on to level. Look for the highest dps roll. Good corruptions: Adds physical damage. Budget option: Any high pdps rare, Kondo's, Doomsower. You can use any rare helm here tbh, or abyssus. BIS - Consecrated Path deals 40% increased damage. You could also get the Blood rage attack speed enchant. Budget option: Flexible. Any rare is fine. Ideally you want the % max life and mana craft. Loreweave is an option for the 78% max res. Budget option: Any rare chest, Tabula Rasa, Loreweave. Lots of life, resists, accuracy. Attack speed and phys to attacks are a bonus. Note: You could also use tombfists for more damage, if you can drop some links and can fit in the resistances. Lots of life, resists. % ele with attacks is a bonus. Life, crit, multi, phys to attacks. % ele with attacks is a bonus. Budget option: Anything with life, res, multi, int. 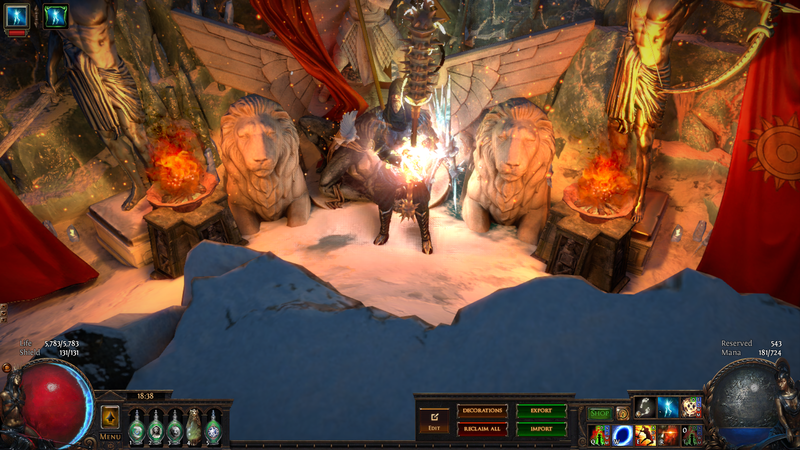 Look for % ele with attacks, % ele delve mod, after you cap your resists and get life. Assassin's mark on hit is a luxury. If you need stats/resists, get a rare ring with life, resists, WED, flat phys instead of mark of the elder. Note: Use Bottled Faith instead of the silver for bosses. 1h and a shield? Or perhaps dual wielding. You could do that. It'll be more expensive, but it'll be faster and will deal about the same damage if you invest. Swap out rare gloves for Hrimsorrow or grab the 3 point of Winter spirit. Swap the two handed cluster near duelist for dual weilding cluster. Use Atziri's Promise instead of the stibnite. And then you want two 400 pdps+ foils, which is the expensive part. The higher the better. If you can get two 400+foils with 'Hits can't be evaded mods' then you'll do far better than voidforge. Shield + sword will do less damage, but it'll be cheaper. Use Lycosidae. Dropped acro and ph acro for more life. Added mark of the elder. Changed the tree a bit to get Winter Sprit. Credit to pill8ws. Depending on the patch notes I think I'll be doing a consecrated path Inquisitor. I was looking at the PoB and the health seems really low, I'm more into super tanky builds. I was wondering which dps nodes you think could be lost without too much of a difference? Thanks for the guide, this skill looks really fun. But anyway, I can't see many dps nodes to lose for health. You could lose some or all of the nodes near path of the warrior and pick more up near the marauder start or scion life wheel, but it'll give you 7k at best. What are your thoughts on playing this build with 1h and a shield? Or perhaps dual wielding. Looks fun, but I played a fair bit of 2h melee last league. I'll probably give it a go either way. C path is an attack, P Flame is a spell. That's a completely different build. I'm playing this build in Synthesis/as my starter. So far I'm in A6 and it's just insane. I went for the sword nodes at the bottom-left of the tree and bought x2 The Princess until I can swap over to 2H Swords. I'll probably swap to Rigwald's at 44 and then Terminus at 51.